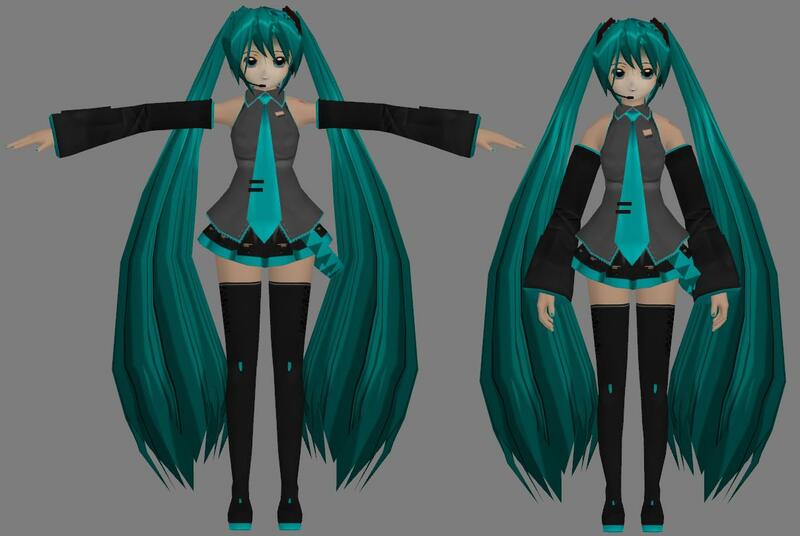 I’ve decide to release my Miku model in 3dsmax format (.max) for free. Recently, i receive too many request asking to port Miku into l4d2. Sorry! I just dont have time for it, so i let you guys to “PIY” (port-it-yourself). So ask someone who really good on this porting to port it for you! First i would suggest you guys use 3ds max 7! the one i use it untill now. I don’t want to any compatible issue appear because the bone is rig in max7, the latest max maybe come up different setting. Miku at first is not my copyright.. but the model i create from zero plane to have a figure .. be considerate of someone hardwork, at least give a credits and donation to the maker, OK? This is great news, I was needing a hair reference so I can get better at modeling hair. Well, maybe your average person doesn’t care, but from a modeler’s perspective this is golden, especially the hands, they are the best modeled hands I’ve ever seen and that shows you really put your heart in to your model. And I’m still wrapping my head around how you made the hair, it seems like layers with progressively smaller and more detailed hair plus a mold for the back of the head. Mmmm, I think i’ll can learning a 3D Model from you. Why does the body not show up in the render window o-o? maybe the radiosity render still on? Nvm. I messed up the textures. I feel like a choob but does it have bones for 3Ds? Wait how do I use them again in 3Ds? I somehow cant manipulate them. Or is it me? I’m having trouble compiling it. I seem to compile it and able to run it on l4d2, however gameplay lag like hell. Like theres some sort of overloading kind of lag. I check the console command but don’t see any error. I was able to got her to hold axe on her hand rather than sticking out from other bones. This is extremely helpful for practicing modeling! I really like the face structure. Love this model, it’s perfect to practice modeling with! For some reason the rest works fine. I can´´t find it in one of your downloads. Also I can’t move the limbs, that means I’ll need to rig it myself ? Ok, it works now. Thanks ! Hi All idk How To put bones For hair? why mine miku colors are silver ? You don’t have to convert it to BMP. 3DS Max supports TGA textures. could i please rig her to mikumikudance? I’m attempting to rig your model in MikuMikuDance. However, No bones appear to show, along with the textures not appearing correctly. If you want, you can contact me through Email and I’ll give you the .PMD file (or an image of what the model turns out to look like). The method I use to export it as .PMD is exporting the .MAX to .OBJ and convert the .OBJ to .X in Metasequoia, and then import the .X file into PMD Editor. When I see it in the PMD Editor, the textures are just one color (and I checked, the textures are in the model and are in the model’s subfolder), and there is only one bone (which is the center bone), and no physics. If you can, can you please help me? Thank you in advance if you can help me. ~Parkman202 of the [PRM]Gaming group. Thank you. I’m going to export it as something else, then. I un-hide the bones, but they still don’t export. Would you care to see a screenshot of what happens? Because I will gladly give you one. Textures are now working, but the bones are not in the Direct3D form. I’ve converted it with it’s bones, but they aren’t Direct3D. May I post something on my Deviant art account and ask if anyone can help me? how the material because I’ve put so transparent material ? I really love every one of your models especially the GMod version. I’ve seen your first Machinima GMod vid and it’s good. Really. I mean really awesome. Hai Amin. It is the purpose im making gmod model is for the public use. You can do freely with it.